A bland, industrial environment in a workplace can very often do the job of giving its occupants a shot of anesthesia. 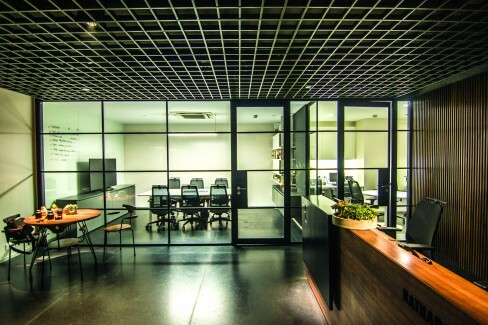 Production inducing aesthetics at a workplace should ideally radiate energy. 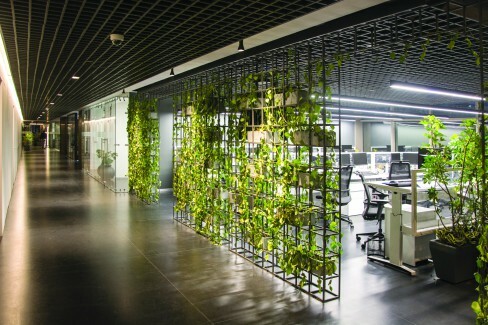 Here is a glimpse of how plants and art can vitalise a space and thus enhance productivity at the office. When architecture and design are completely anchored in the program and site, the planning of spaces remains unfazed by trends. 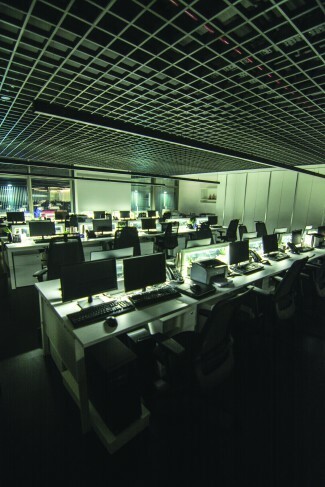 The office of Ratnabali Capital Markets Pvt. Ltd – a SEBI registered company rooted in Kolkata, designed by Practice Design Pvt. Ltd. is a sheer manifestation of this belief. A fortified locus of thoughts oblivious to conventional norms describes the site’s relation to its culture and metaphysical origins.In fact, the office of RCML reiterates the architecture studio’s ethos completely. 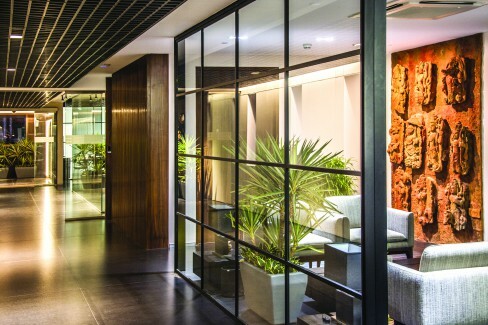 Backed by black framed glass doors that open up to team discussions,the waiting area also serves as a little centrality where people can gather for informal meetings. The linear floor plate spans across 12,000 sq ft expressing the corporate identity of the financial services company on a spatial scale. A series of open offices and quiet workspaces are aligned along an interactive breakout ambulatory – ‘The Track’ that slices horizontally through the office, organising work flow in the internal spaces. “It has a dramatic approach and a series of sequenced frames lead from a warmer vestibule towards predominantly white open-plan clusters,” share the architects. The office structure is as simple and direct as possible. As the open office provides for direct collaboration, quiet workspaces act as a refuge for those who value a little more silence. While the central lounge breaks the linearity of ‘The Track’, the reception wears an impressive personality as it welcomes you in. Abandoning the traditional waiting area, it harbours a small round table that mimics an experience taking you to the casual ambience of a cafeteria, relaxing your senses the instant you enter making you psychologically forget the rigidity of the formal. 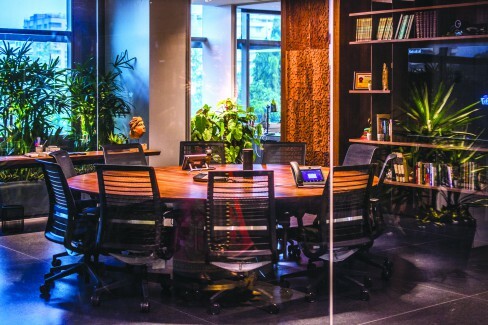 Backed by black framed glass doors that open up to team discussions it also serves as a little centrality where people can gather for informal meetings. Simple forms and intersecting geometries render a bespoke and sophisticated interior to the modern minimal board room and director’s suite. No screening has been proposed between the main spaces. 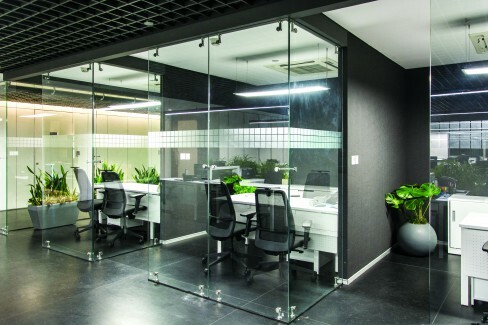 Glass partitions and enclosures facilitate a wide and free work atmosphere along with visual communication between zones. Reminding visitors that they are in the country’s artistic capital is a set of locally sourced terracotta murals on the wall that depict the ‘Dasavatar’ of Lord Vishnu. The hallmark of new spaces is a non-beige palette and the greyscale colour scheme defined by flamed black granite, grey vitrified tiles and brushed steel has been dressed with glimpses of art and green foliage that inject colour. In fact, the melding of local tradition and western instruction has cultivated a new appetite for architecture and design that adopts a way of building which is steeped in the cultural history of Kolkata but looks ahead to the future at the same time and is far from nostalgic. An idol of Durga at the entrance puts an interesting spin to the symbolic negative red colour of the financial industry, by portraying it is an emblem of power, inspiring a bounce-back when the graph begins to decline. Reminding visitors that they are in the country’s artistic capital is a set of locally sourced terracotta murals on the wall that depict the ‘Dasavatar’ of Lord Vishnu. The main challenge was to control the IAQ. Filtration and dilutions of particulates and pathogens, increasing the levels of oxygen in the interiors and energy efficient approaches instead of mechanical ways were adopted to tackle the problem. Plants like Green Dracaena control humidity, Silver Yucca converts carbon dioxide into oxygen, Schefflera, Philodendron, Rhapis Excelsia and Money Plants absorb toxins. This helped economise the system negating the introduction of treated fresh air and resulted in a saving of 20 KW/hr. 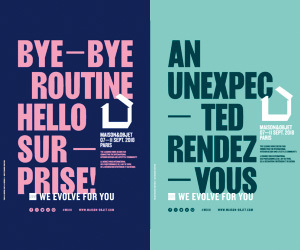 “Thus far from ostentatious, the organic aesthetic reinforces the brand identity, enhances client experience and improves business efficiency, establishing a sense of community within the office in a way that only boosts RCML’s morale,” says the team. 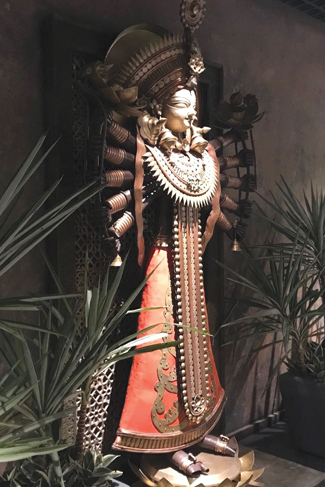 An idol of Durga at the entrance puts an interesting spin to the symbolic negative red colour of the financial industry by portraying it as an emblem of power, inspiring a bounce-back when the graph begins to decline. An exhibit of exquisite Bengali craftsmanship, a finely chiseled wooden shutter stands next to a walnut veneered panel. A Buddha statue radiates calmness into the busy work environment that reflects on the monitors of the dealing room. Height adjustable ergonomic workstations from Steelcase introduce a new comfort zone. The library area in the middle is decorated with dense foliage. “It is designed to be an oasis that enlivens the stark interiors,” inform the architects. Raising the index of simplicity and creative dynamism, it won’t be wrong to say that this project delivered by Practice Design demonstrates a simple yet clever means to boost performance in an era where even a cursory online search turns up pages after pages of complicated productivity secrets.